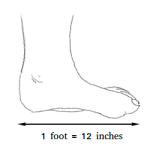 A decimal point is a small dot used in writing a decimal fraction or a mixed number. 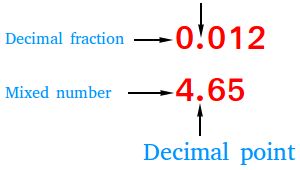 Notice that in a decimal fraction, 0 is usually placed before the decimal point. In a mixed number, the decimal point separates the whole number part from the fractional part. In a decimal fraction, we don't read the zero on the left of the decimal point. In a mixed number, the decimal point is read as "and" and we do read the number on the left of the decimal point. In money, the decimal point is used to separate dollars and cents. $5.64 is read as five dollars and sixty-four cents.